I am pretty drunk now, but maybe that makes me more honest and more direct about my thoughts about Bob Dylan’s slated live album, At Budokan. I think it has been undeservedly put down by critics and the public in general. It is a good live album! It was my first real meet with Dylan, my friend Ståle had borrowed it from one of his brothers, he left it at our house and it stayed there for several years! I loved it from the start, I didn’t know what Bob Dylan was all about, I just knew that I liked the album, all of it! I have read about it since, in several books and many web-sites, I understand that I’m not supposed to like this album, and still I love it. I love every take, I know all the songs and I cannot understand how Dylan could better these incredible performances? It is a laid-back masterpiece. 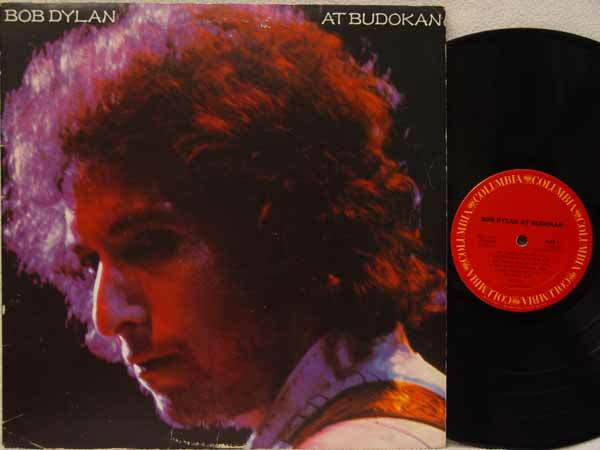 Bob Dylan at Budokan is a live album by American singer-songwriter Bob Dylan, released on April 23, 1979 by Columbia Records. It was recorded during his 1978 world tour and is composed mostly of the artist’s “greatest hits”. The performances in the album are radically altered from the originals, using the same musicians that backed Street-Legal, but relying on a much larger band and stronger use of brass and backup singers. In some respects the arrangements are more conventional than the original arrangements and the album was criticized for being so. At the same time that it was criticized for being too polished, it was criticized for being too sloppy. For a few critics, such as Janet Maslin of Rolling Stone, the differences between the older and newer arrangements had become less important.